CNJ #3672, an EMD GP40-P, comes off the Lehigh Valley Railroad and begins down the ramp towards the old "home rails" of the CNJ. Looming in the background is the ever present Romerovski tower. Here we see the RVRR tracks alongside the ramp that connects the CNJ with the elevated LV main. Although there was plenty of clearance here for both parties, engineers couldn't help but feel a "little too close for comfort." 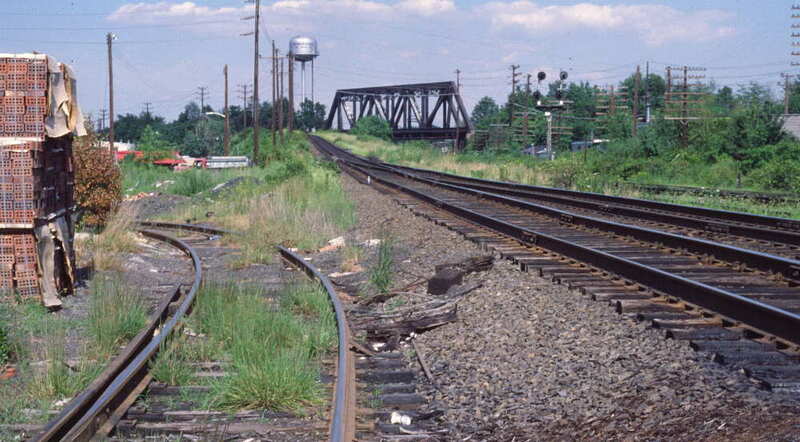 The original RVRR-CNJ interchange had the RVRR's tracks curving towards the LV's bridge seen in the distance. 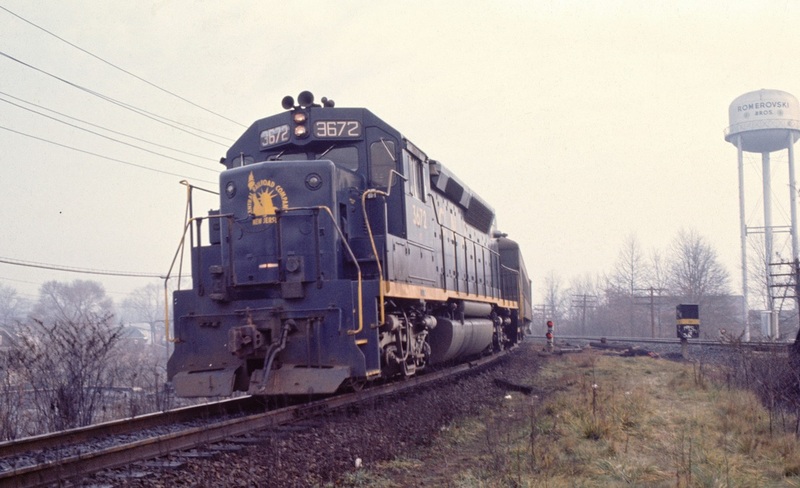 By the mid-1960's the Central Railroad of New Jersey (a.k.a. "Jersey Central ") was losing money and entered bankruptcy in early 1967. Eager to cut costs, the CNJ turned to the state for some sort of solution. The state wished to keep rail commuter service alive in the Garden State and began to hash out a plan for the flailing carrier. What the state came up with was called the "Aldene Plan." The essence of the plan was to close the CNJ's Communipaw Terminal and ferry service in Jersey City and divert rail traffic to Newark Penn Station via trackage rights on the Lehigh Valley Railroad. The plan called for a connection to be constructed in Aldene (a section of Roselle Park, NJ) between the CNJ and LV. A ramp was built to connect the elevated LV mainline to the level CNJ line. 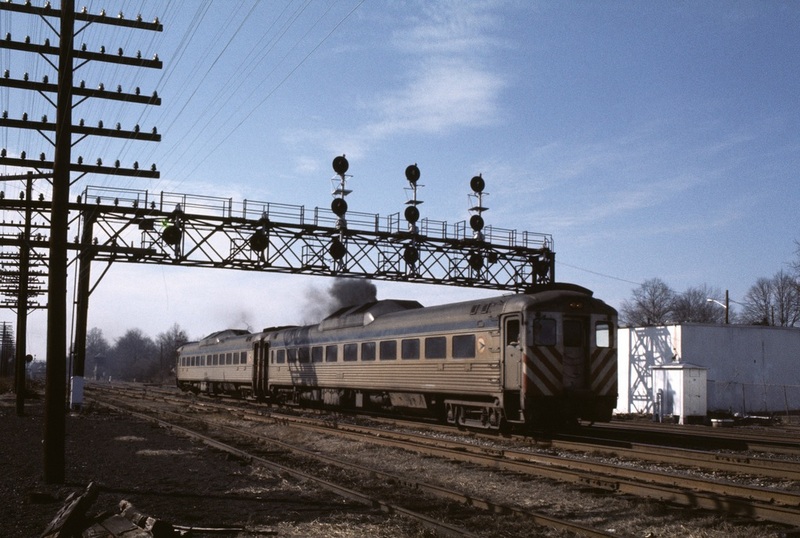 The construction of this ramp interfered with the RVRR's connection to the CNJ, so the RVRR connection was simply 'flipped.' Instead of the RVRR curving towards the west to connect with the CNJ, it would now curve towards the west. The Aldene Plan was implemented on May 1, 1967. Afterward the CNJ mainline which headed into Elizabeth, and eventually to Communipaw, saw little service. Freight service was maintained on this portion of track to serve a handful of customers, also passenger service was maintained between Cranford and Bayonne over these tracks to serve a number of commuters who relied on the service. 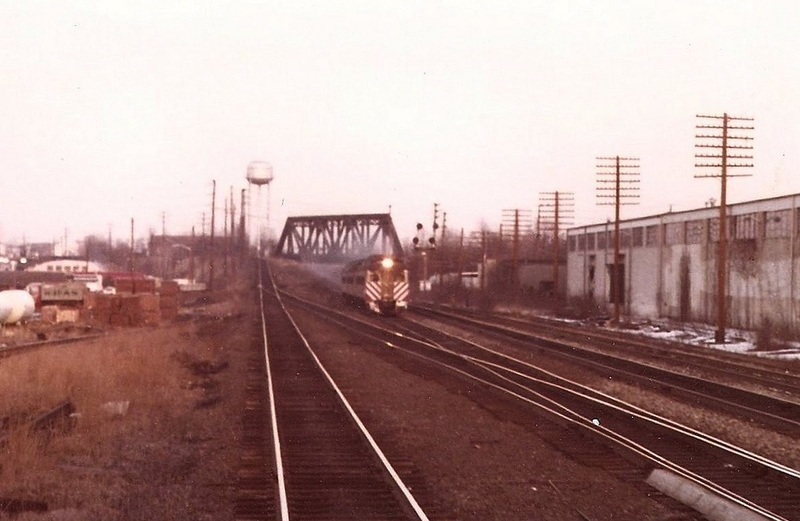 The "Bayonne Scoot" was done away with in 1978, freight service eventually dried up, and this portion of track between Aldene and Elizabeth was subsequently abandoned. Here we see the "Bayonne Scoot," made up of two Budd RDC units, rolling through Cranford/Aldene on its way towards Bayonne. In the distance on the far left can be seen Excee Tower. Heading towards Cranford, we see the "Bayonne Scoot" has just travelled under the Lehigh Valley mainline. The tracks of the Rahway Valley can be seen on the far left, to the left of the ramp. March 1977.